Christopher Nolan's Dunkirk is an extraordinary display of filmmaking prowess. It's tour de force cinema; a gripping story of survival told through cutting edge camera work and bare bones storytelling. Instead of inundating his audience with carnage, Nolan keeps his gritty realism firmly in the PG-13 realm. The dire optics of fight or flight under nonstop attack is delivered with zero introspection. There are no bravura monologues, tender goodbyes, or moments of levity. Dunkirk is as straightforward and merciless as it gets. Escape or die fighting. In 1940 on the coast of France, Allied soldiers are trapped on the beaches waiting for rescue. Four hundred thousand men are under siege as German forces advance. British destroyers are sitting ducks for the Luftwaffe. The Royal Navy issues a decree for all local boats to Dunkirk. Get these men back to England by any means necessary. It is a mad scramble as soldiers line the sand to the horizon, desperately looking for ships. Their hope for an armada is dashed. They realize the government is saving military resources to defend the homeland. Dunkirk is seen from several points of view. Events toggle back and forth in time to paint a full picture of the chaos. Commander Bolton (Kenneth Branagh) and Colonel Winnant (James D'Arcy) orchestrate the evacuation as officers. 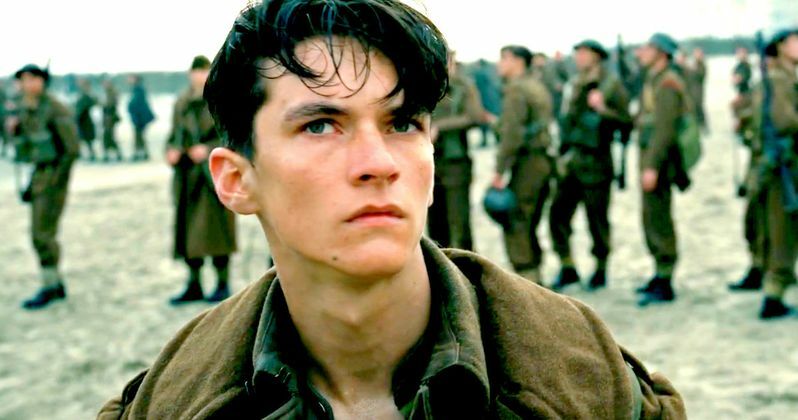 Tommy (Fionn Whitehead) and Alex (Harry Styles) are grunts trying desperately to find a boat. Farrier (Tom Hardy) and Collins (Jack Lowden) are Spitfire pilots; making every shot count to hold off the German air attack. Good samaritan Dawson (Mark Rylance) and his sons make their way across the English Channel on their fishing boat to help. Picking up a shell-shocked soldier (Cillian Murphy) stranded in the water. Dunkirk does not overreach in its approach. At a lean hour and forty-seven minutes, every second on screen is precious. The characters are at a hundred percent survival mode for the entire runtime. While some situations are more urgent than others, each man has only time to act not think. Farrier is running out of fuel on his plane. The men on the beach dodge aerial bombardment and sniper fire. The fishing boats en route also come under vicious barrage. The narrative is not about character development. We do not get to know these men in any sense of the word. They are brothers in arms trying to live. Their journey is the film. Dunkirk's cinematography, editing, and sound design are beyond spectacular. The scenes shot with the IMAX cameras fill the entire behemoth screen. Tom Hardy's soaring dogfights will give you vertigo. The crushing claustrophobia of sinking ships, tilts the screen, and drowns your senses in rushing water. Christopher Nolan utterly sells the experience of war with his film mastery. Dunkirk will certainly be nominated for every technical award. As it stands, Nolan is definitely in the lead for the Directing Oscar at this point in the year. I absolutely love Dunkirk's scant dialogue. As stated previously, there isn't any time for discussion in this story. Nolan sticks to his narrative glue. He doesn't sully the experience with wasted melodrama. We do see heroics, but these are the actions of men acting purely. It is a testament to the sacrifice of the soldiers and the unbelievable situation they were faced. Any filmmaker who wants to direct a war movie needs to study every single frame of this film. It is the perfect example of restraint from hyperbole. From Warner Bros., Dunkirk surpasses expectations. It is a dramatic success in a summer dominated by popcorn films. Christopher Nolan is back on the auteur footing of his Dark Knight Trilogy and Memento. Dunkirk needs to be seen in the best theater possible, either true IMAX or venues with a 70MM projector. It is worth the price of admission and then some.